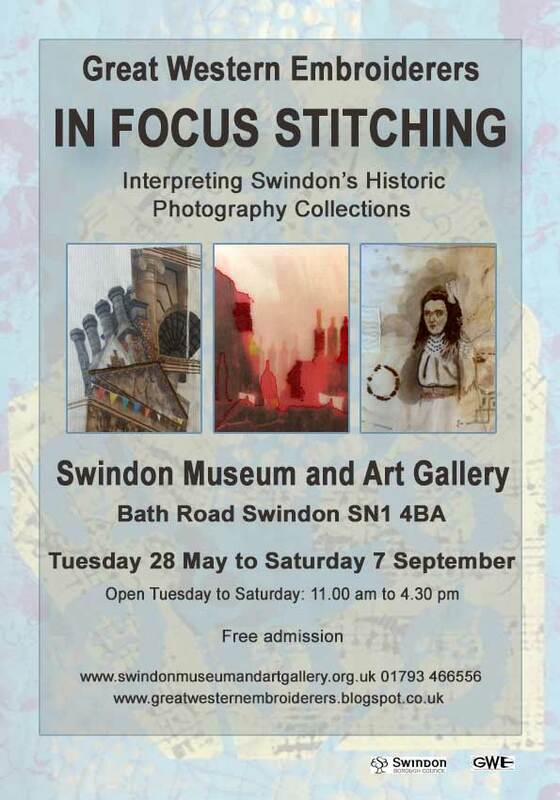 Here I'm showing individually and in detail several pieces from the exhibition by Great Western Embroiderers that particularly caught my eye as we were hanging. They chose themselves because of the differences in underpinning idea, technique and presentation that were used and the emotional impact they made on me. The overall theme within which we were working was landscape in all its forms - panoramic and close up, mapped, abstracted and pictorial, of sea, town and city, and rural. It was fascinating to see how differently each member interpreted the brief. 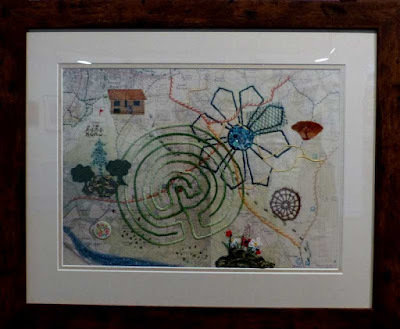 First of all, there is A Journey in East Sussex, a most thoughtful mapped hand stitched piece by Anne Carter. I have included it here because of the glimpses of rich meaning for her which underpin it. She said of this work, 'This piece began when I walked a labyrinth on a retreat and then began to connect that with a map from Forest Row where I used to live. The result combines ideas, not just of a physical journey, but of a spiritual journey too'. I found discussing this piece with her most affecting. 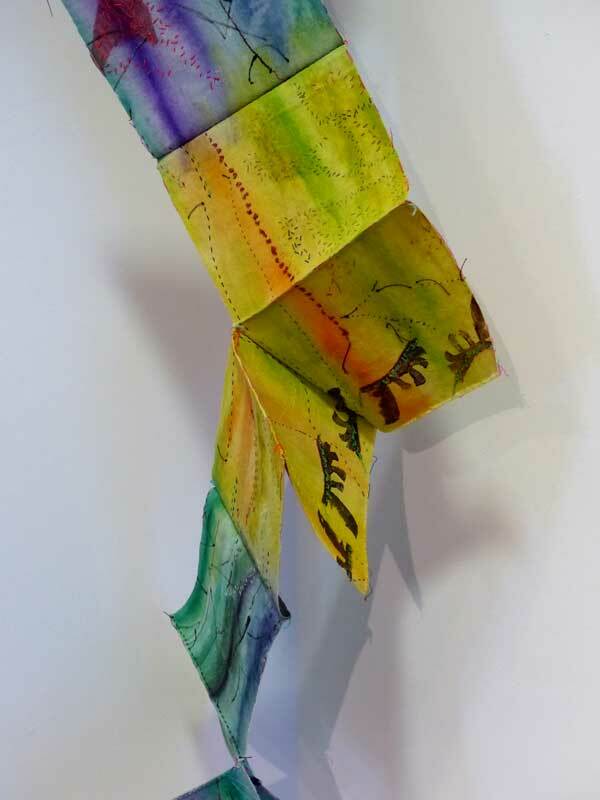 Next, I enjoyed a hanging book form by Ruth Hayman entitled An Alternative Landscape. I've shown her work before and as so often, I was taken by her 3 D interpretation of the theme. In this gallery, we are pretty much restricted to flat pieces which hang on the wall but Ruth managed to find an ingenious way round this problem. 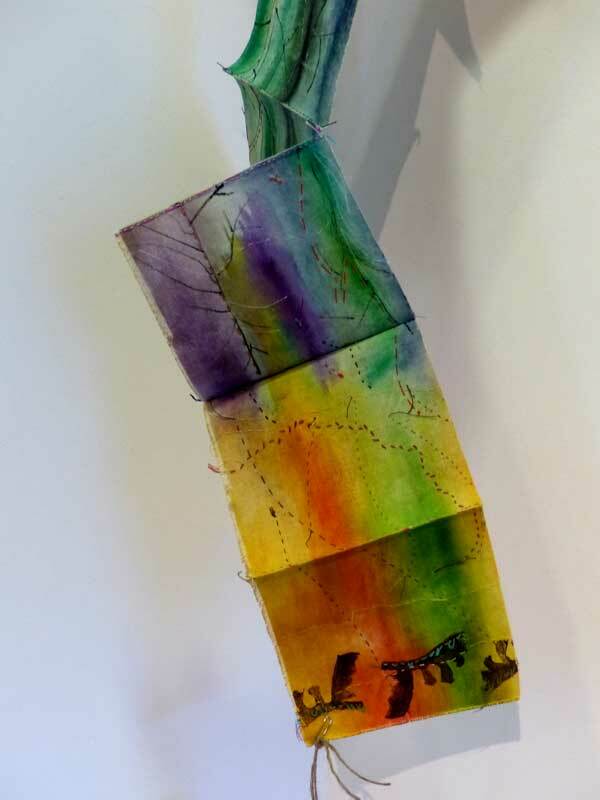 This piece features a brightly coloured painted and folded canvas surface onto which Ruth has transposed a language of landscape marks in print, hand stitch and drawing. 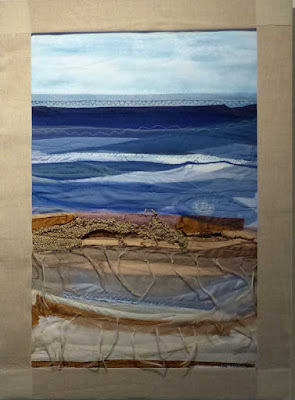 And then follows a series of three pieces: Marlborough Downs by Maggie Harris. 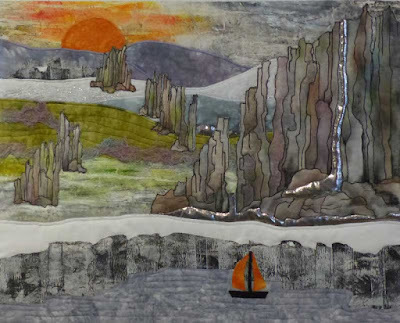 These are beautifully delicate landscapes with machine embroidery and acrylic paint on cotton. I think these need to be seen to be enjoyed fully but I found them very gentle and calming and greatly enjoyed the colour palette. Last of all come two pieces by Pat Roberts. Pat's current work often features idealised landscapes using appliqué with richly textured colour and embellishment. 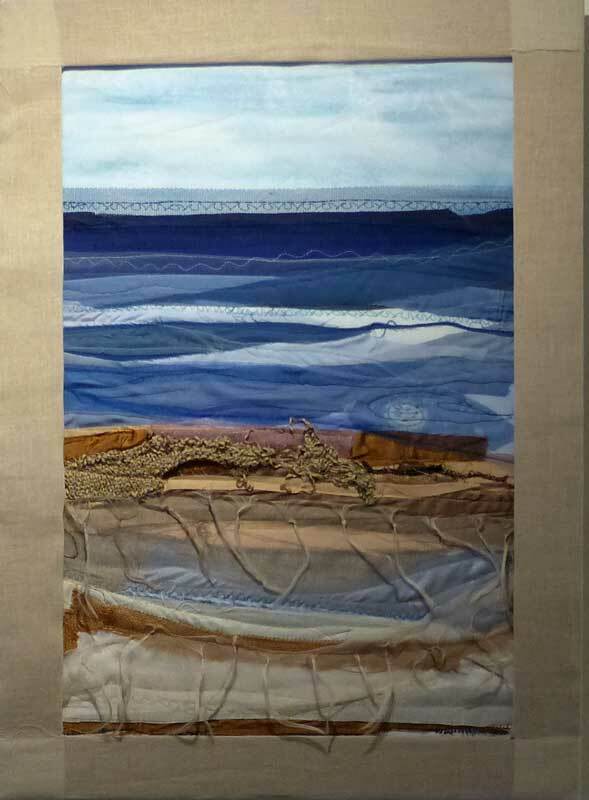 The first of these, Far Horizons, we chose to feature on our exhibition poster as it seemed to sum up what the group is about, featuring as it does both machine and hand embroidery. And the last, Jurassic Coast, Pat describes as 'a landscape as seen from the sea'. It was completed following a workshop delivered to the group earlier this year. I particularly enjoyed the use of stitch to create texture. This selection represents a very personal view of the exhibition. It remains open until Thursday 24 November. Looks like it must be a great show. Some very intriguing pieces here....wish I was closer!! A lovely range of work represented - and variety is what we're all about!